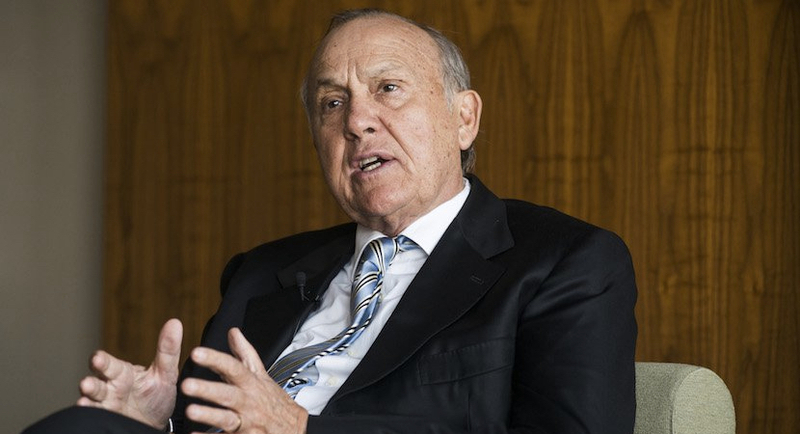 (Bloomberg) – Christo Wiese, South Africa’s fourth-richest person with a fortune of about $5.7 billion, is at the center of plans to create the continent’s largest retailer by combining the African operations of Shoprite Holdings Ltd. and Steinhoff International Holdings N.V. Here’s why a transaction makes sense for the 75-year-old billionaire and why a deal may face opposition from minority shareholders and antitrust authorities. Why are Shoprite and Steinhoff proposing to merge? The proposal is for Cape Town-based supermarket chain Shoprite to buy Steinhoff’s African retail assets in exchange for an undisclosed yet significant equity interest. This could lead to Steinhoff taking control of Shoprite via a buyout offer to minority shareholders. Talks on pricing and structure are ongoing and some investors and analysts expect the companies to announce an outcome in coming weeks. That helps Wiese bring part of his 23 percent stake in Steinhoff and his 16 percent share in Shoprite under one roof. It may ultimately also help bring both companies under Steinhoff Chief Executive Officer Markus Jooste, a friend and business partner for two decades. “He appears to have anointed Markus as the person he has entrusted with the family jewels,” said Sasha Naryshkine, an analyst at Vestact Ltd., a Johannesburg-based money manager. Wiese pulled off South Africa’s largest takeover deal in more than a decade when he agreed to sell South African clothing retailer Pepkor Holdings Pty Ltd. to Steinhoff in 2014. The deal, he said at the time, followed years of talks with Jooste about building a world-class discount retailer and was driven by the idea that their assets make an excellent fit. Bringing together Shoprite and Steinhoff will give the combined entity the scale to sell everything from potatoes to sofas and sneakers at discount prices to consumers on the continent. Steinhoff has more than 11,000 retail outlets in 32 countries. In Africa, its Pep clothing retailer accounts for about 2,000 shops. Shoprite had 2,711 supermarkets across Africa as of June. Separating Steinhoff’s African assets from operations elsewhere in the world, such as Conforama of France and Mattress Firm in the U.S., will help both parts of the business pursue their own growth opportunities. What are the potential competition hurdles? The sheer size of these companies means there could be several antitrust hurdles within South Africa, Simon Roberts, a director of the Centre for Competition, Regulation and Economic Development at the University of Johannesburg, said by phone. The combined retailer may be ordered by the competition authorities to sell some assets, such as either companies’ furniture units, or to ensure no jobs are lost for a set period of time. Also read: Meet Steinhoff’s R10bn man: New Poundland boss, former ASDA CEO Andy Bond. One way of tackling potential competition problems with the furniture businesses, in which the combined entity would control a relatively small market, would be to spin off and seperately list Steinhoff’s JD Group, Naryshkine said. Selling certain brands could also be an option, he said. What do investors other than Wiese think about the proposal? Without any details on the pricing since the announcement that the companies are in talks, the shares have declined. Steinhoff shareholders paid a “full price” when the company bought Wiese’s clothing retailer Pepkor for R62.8 billion ($4.7 billion), Evan Walker, a money manager at 36ONE Asset Management, said by phone from Cape Town. In addition to Pepkor and furniture chain JD Group, Steinhoff also owns South African tilemaker Iliad Africa Ltd., an auto business and manufacturing firm KAP Industrial Holdings Ltd. This makes a potential deal “messy” and investors reluctant to own shares in the combined entity, Walker said. The proposal has, though, won the support of South Africa’s Public Investment Corp., the continent’s largest money manager with R1.86 trillion in assets and a shareholder in both companies. The PIC, which manages government worker pension funds, is the second-largest investor in Shoprite with a 10 percent stake, according to data compiled by Bloomberg. Shoprite’s stock has dropped 9.7 percent since the talks were announced on Dec. 14 and trades at 17.5 times estimated earnings. Steinhoff has declined 5.2 percent and trades at 14.4 times estimated earnings. What will the combined company look like before disposals? With Steinhoff’s African operations amounting to about a third of the company’s assets, its brands in Africa include Pep, Ackermans, Russells, Incredible Connection and Timbercity. Shoprite owns brands such as Checkers, Hungry Lion, OK Furniture and MediRite Pharmacy. Shoprite’s revenue was R130 billion in the 12 months through June. Steinhoff’s African units generated 4.3 billion euros ($4.6 billion) in the 12 months through September.